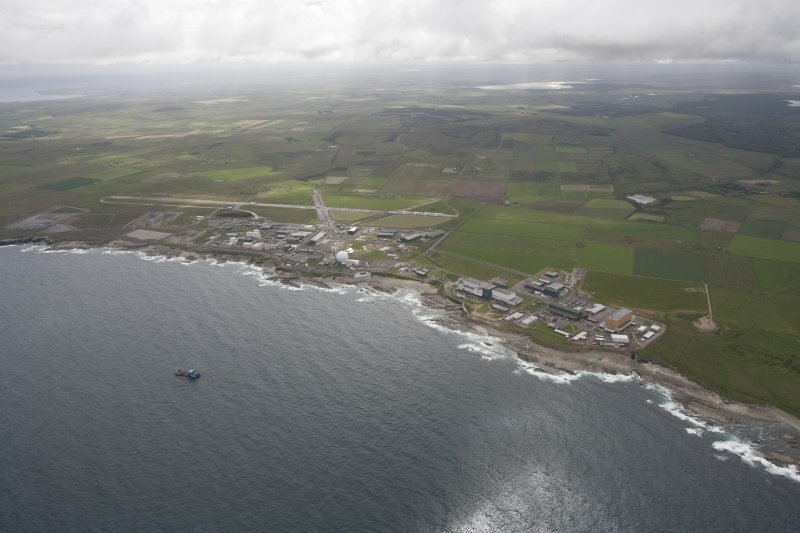 Oblique aerial view of Dounreay Nuclear Development Establishment, centred on the SW site, looking SE. 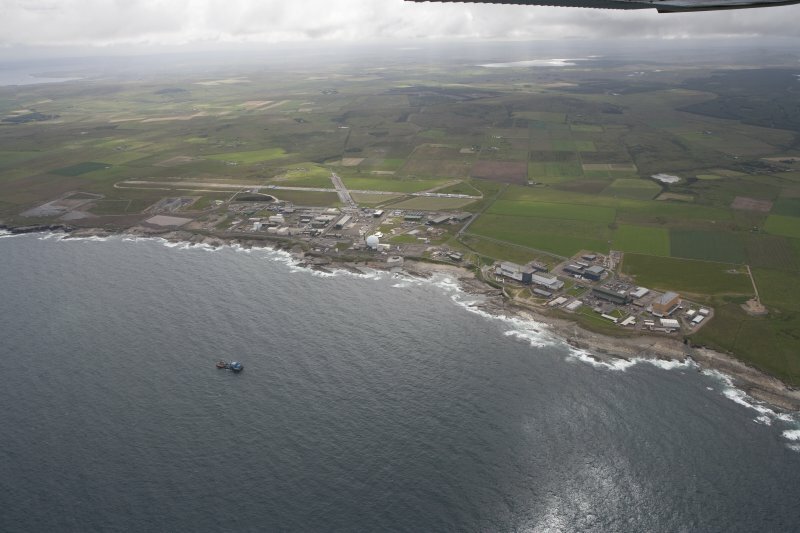 Dounreay Castle is built on the L-plan and is closely comparable with Lowland tower-houses. The main block measured 39ft 6ins by 23ft 8ins, and the wing 14ft 4ins by 18ft 6ins, with walls some 3ft 6ins thick. It consisted of two storeys and an unvaulted basement. The castle probably dates from the second half of the 16th century. 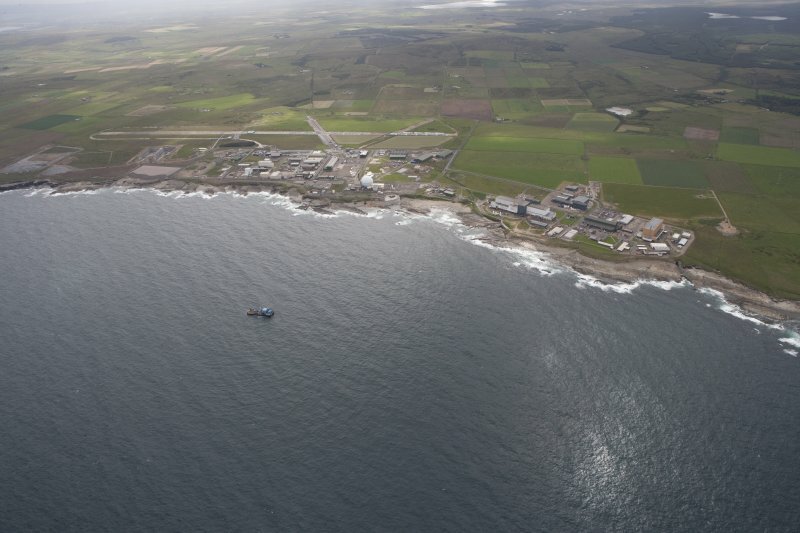 In 1614 it was the property of William Sinclair of Dunbeath, and in 1726 it is described as "one of the Earl of Caithness's lodgings". It remained in occupation until 1863, but was unroofed and ruinous by 1910. 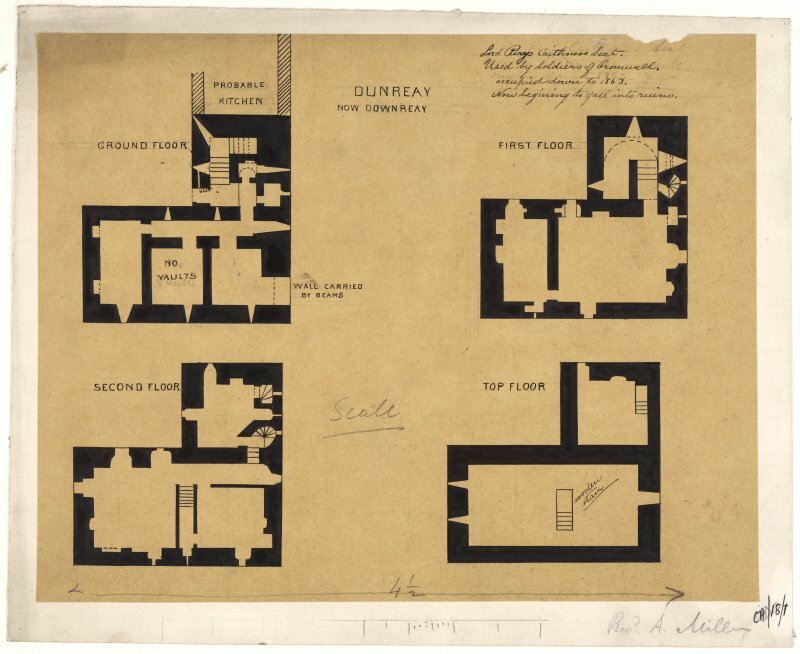 R Gordon 1813; D MacGibbon and T Ross 1887-92; W Macfarlane 1906-8; RCAHMS 1911. The remains are generally as described above, but are in a very dilapidated condition. The NW angle has collapsed and the N wall is bulging out at the top. The interior is a mass of fallen masonry. Visited by OS (N K B) 20 November 1964. 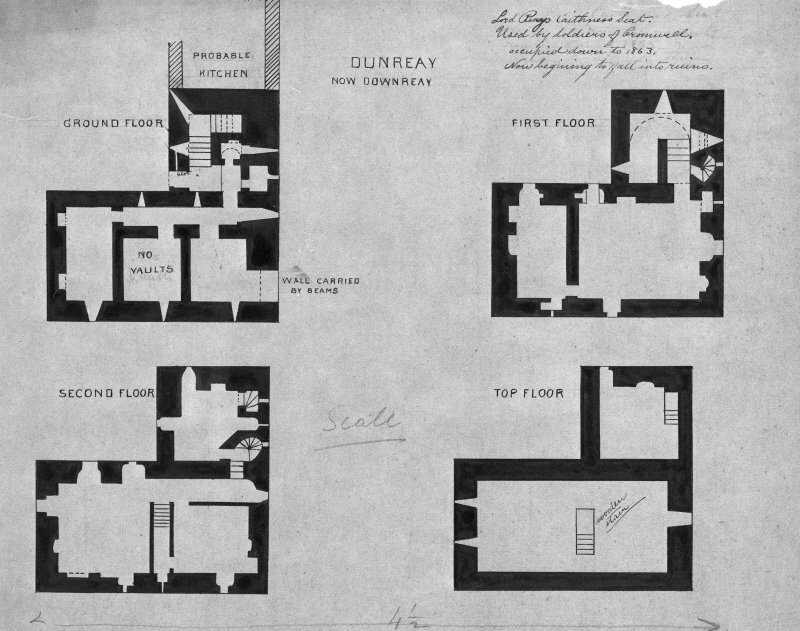 Dounreay Castle is as described and illustrated by the previous authorities. NC 9830 6693 An archaeological monitoring exercise was completed from October 1997 to January 1998. 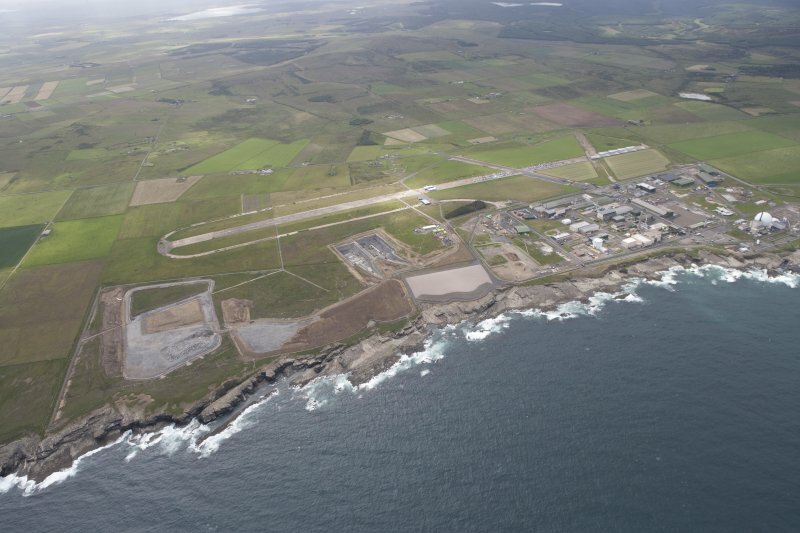 The site affected by ground-breaking work comprised the castle courtyard and a small area of the beach - which proved to be largely archaeologically sterile, with the exception of the find of a large millstone, probably associated with the mill shown on the 1st edition OS map of the area. Excavation of individual 2m squares over a grid was conducted by machine, with video monitoring and photographic coverage being employed by the archaeological team, based off-site but nearby. At no time during the excavations were the archaeologists able to gain direct access to the site, but a continual video monitoring exercise was maintained. Non-archaeological on-site excavation staff aided in the taking of photographs and survey levels. The excavation was accompanied by a brief survey review of the upstanding remains, based on a previously undertaken digital survey of the walls. The resulting elevations were annotated, and the evolution of the buildings, as determined from the standing remains, described. In addition, a small amount of documentary research was conducted. The original castle was built in the later 16th century on the 'L'-plan, and featured a barmkin enclosure wall, part of which still stands on the SW side of the site, and which is keyed into the SW wall of the tower itself. Elements of the barmkin wall also survive on the seaward side of the courtyard, incorporated into a later cottage wall. The courtyard area so defined was paved in Caithness slabs, laid in some places almost directly over bedrock. Soon thereafter a kitchen range was added to the SE wing, built directly against the barmkin, and blocking an original gun loop at the corner of the tower wing. The castle is known to have housed Cromwellian troops in the mid-17th century, but the state in which it was left is unknown. However, at a potentially 17th-century date, the first of two ranges of cottages may have been added to the castle, at the SE side of the courtyard. A crow-stepped gabled building is depicted by MacGibbon & Ross in this position, and the remains of a stone building were revealed in the excavations. During the 19th century the site became a large farm, with additional accommodation being provided by the still-standing cottages adjoining the castle to the NE. The courtyard now saw use as a farmyard, and a rich organic horizon was identified in the excavations above the flagged surface level. The farm is depicted on an aerial photograph of the mid-20th century. 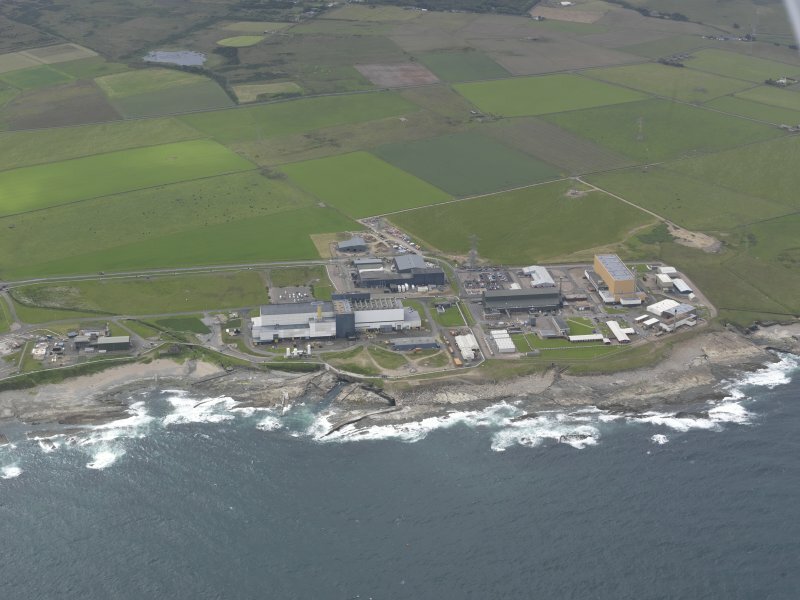 Finally, the site was levelled, with the exception of the castle and NE cottage block, and the site was occupied by the nuclear research establishment. The monitoring project proved to be a successful exercise, despite the uniquely challenging nature of the site, and the drawbacks imposed by the excavation methodology.